Two books from October 30, 2013. 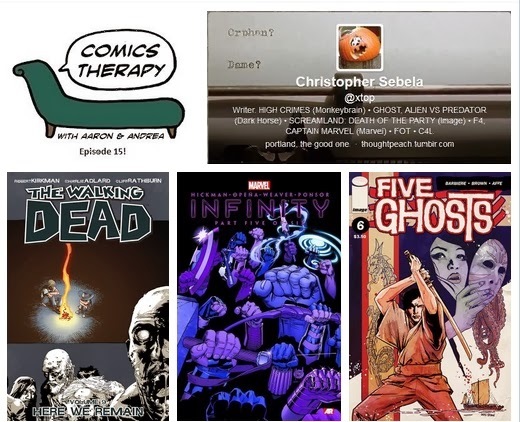 Plus Nerd Confessions, Aaron's Inner Child and a special edition of Grief Counseling. You know, for kids. And on The Couch this week: writer Christopher Sebela. The theme of the show is...well, sorta scary Halloweeny stuff, sorta Aaron getting to talk about Infinity again. But Andrea read more of The Walking Dead, so that's sorta thematic, right? And definitely both of your sorta dedicated hosts had been drinking before the show, so it's super festive up in these parts. Sorta. Fabian Gray is a bit like Indiana Jones meets Doctor Strange, with a haunting for every different type of literary nerd out there. Why is this event so damn great? If you have a spare five hours, Aaron will gladly tell you. Before you go attacking Aaron, this was Andrea's idea. It's fiiiiiine. She had a month off, and this volume wasn't as traumatic as the previous one. There's no crying, just yelling at Aaron as per usual. Chris writes High Crimes, published by MonkeyBrain Comics (and which we talked about back in Episode 2), and the upcoming Alien Vs Predator from Dark Horse Comics. He’s the co-writer of Ghost, also from Dark Horse, and has co-written Captain Marvel and Fantastic Four from Marvel. His first book, Screamland, was published by Image Comics and he’s also a contributor to Rachel Deering’s upcoming In the Dark anthology published by IDW. He's got solid horror cred.